The Muller Berkeley Earth ​​study computed the greatest number of land surface temperatures ever recorded, and showed that the global land surface temperature has increased by 1.5 degrees C over the past 250 years. The increase has slowed in just the past few years. Interestingly a 2013 paper Monitoring European average temperature Warming in Europe found it to be accelerating. A 2013 re-analysis ​​​study of ocean warming Distinctive climate signals in reanalysis of global ocean heat content (2013) has found extraordinary recent warming of the deep ocean. This rate of deep ocean warming may be unprecedented and it is associated with less heating of the surface ocean. 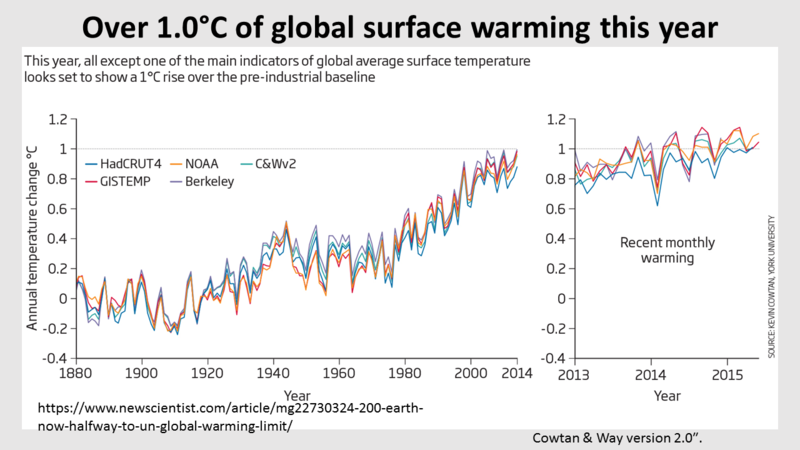 As the surface of the planet is mainly water this indicates planetary warming in fact has accelerated. A Sept 2013 Review ​of global ocean temperature observations: Implications for ocean heat content estimates and climate change "The total energy imbalance at the top of atmosphere is best assessed by taking an inventory of changes in energy storage. The main storage is in the ocean ... multiple studies show that there has been a multidecadal increase in the heat content of both the upper and deep ocean regions, which reflects the impact of anthropogenic warming. With respect to sea level rise, mutually reinforcing information from tide gauges and radar altimetry shows that presently, sea level is rising at approximately 3 mm yr−1 with contributions from both thermal expansion and mass accumulation from ice melt." ​We must consider the temperature change of different regions to assess global warming danger. Increased Radiative forcing (total heat in the climate system) correlates directly with the total increase in atmospheric GHGs. 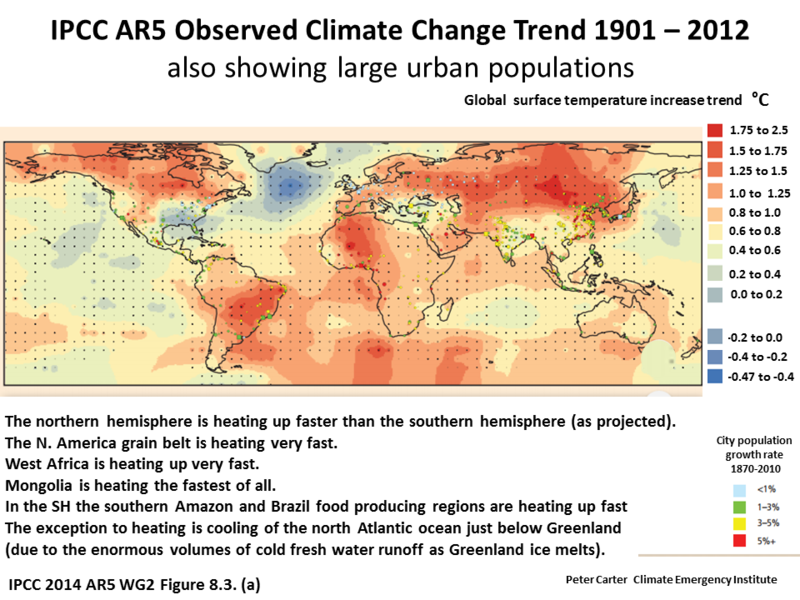 The NOAA converts the two into a GHG Index which provides a measure of the increase in GHG heat in the whole climate system. It is the best single index of global climate change to use. Climate forcing growth rates: doubling down on our Faustian bargain J Hansen 2013. 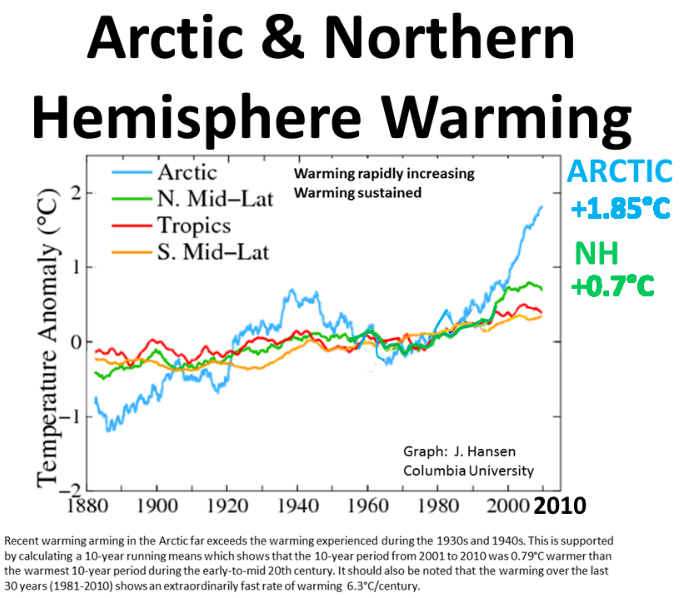 As predicted decades ago the nothern hemisphere is warming faster than the southern (which has more ocean) and the Arctic is warming fastest of all (Arctic amplification). ​​Extreme rapid Arctic warming is a planetary emergency because the largest sources of carbon which will be released by more with warming - are in the Arctic, like permafrost. 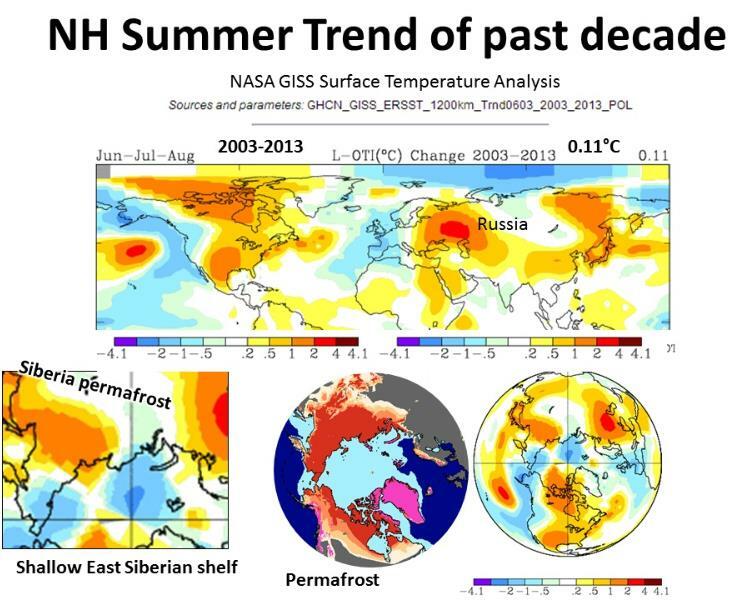 ​Recent climate changes have had widespread impacts on human and natural systems. 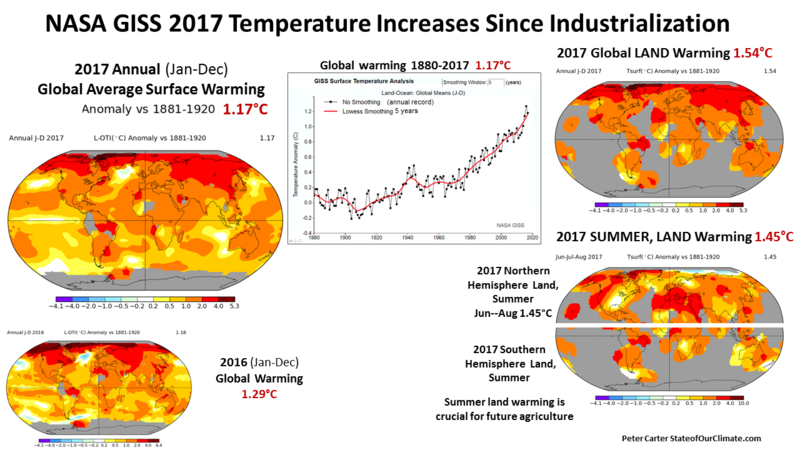 Global warming is the increase in global average (land-sea) surface temperature, as one of the consequences of radiative (heat) forcing caused by anthropogenic (human sourced) emissions (from IPCC 2014). 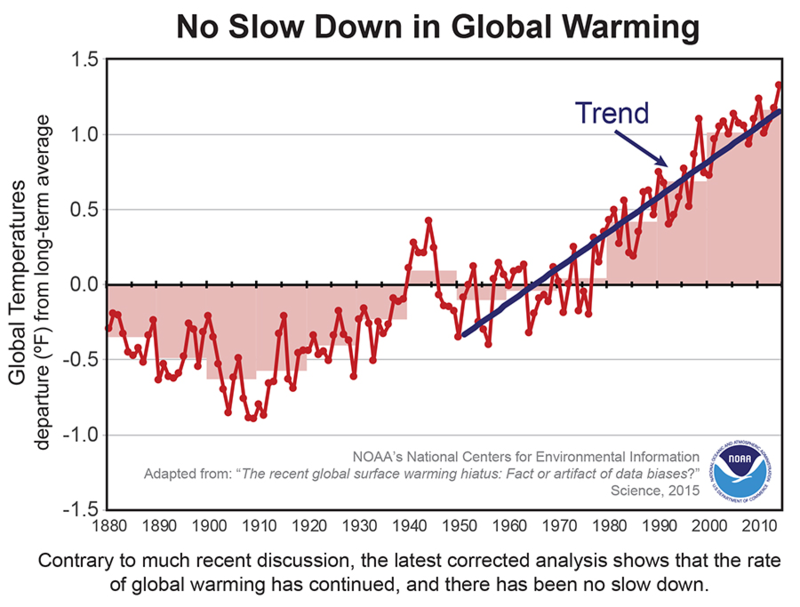 There was never any question in the science that emissions of greenhouse gases would cause global surface warming, increasing with the amount and duration of emissions. The very atomic structure of GHG molecules (dipole) determines that as fact. 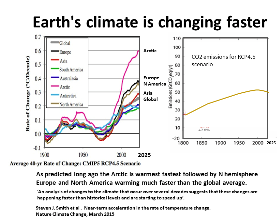 Since the first IPCC assessment in 1990 that has been certain. • emissions resulting from human activities are substantially increasing the atmospheric concentrations of the greenhouse gases carbon dioxide, methane, chlorofluorocarbons (CFCs) and nitrous oxide These increases will enhance the greenhouse effect, resulting on average in an additional warming of the Earth's surface The main greenhouse gas, water vapour, will increase in response to global warming and further enhance it' (IPCC 1990 1st Assessment WG1 Science Executive Summary). 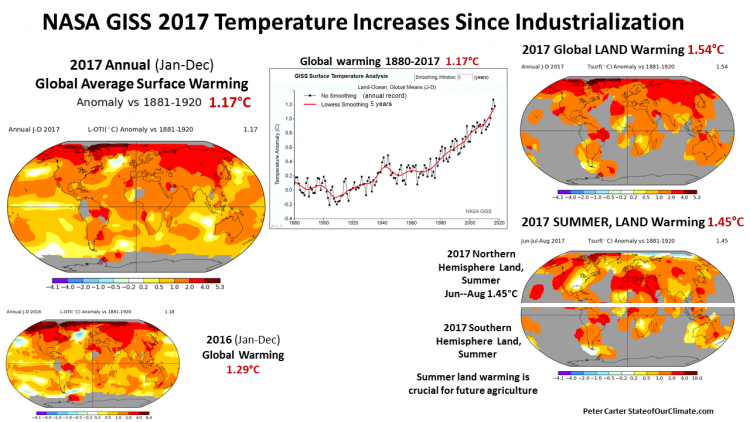 Ocean heat: global warming ​​says nothing about the >90% of GHG heat that goes to ocean warming. The heat in the oceans is a commitment to higher degrees of future global​ warming, even with rapid reductions of emissions. Amplifying feedback emissions: global surface warming will (and is) cause additional feedback emissions from the warming planet surface. That is an extra global warming commitment resulting from the above two commitments. The obvious example of an amplifying feedback is the increased forest fires.